The Georgetown Club, an elegant private country club nestled amid horse farms 35 miles north of Boston, seemed like a picture-perfect place for a fall wedding. The main dining room looks out onto a velvet green golf course, surrounded by towering trees. The linen table cloths fell from table top to the floor, with wooden chairs painted gold. The out-of-luck brides are the latest casualties of the financial troubles at the club, saddled in recent years with declining membership amid a bad economy. More than 100 members have left the club in recent months, and 15 weddings were cancelled in the last year, said Dr. Peter Wojtkun, a managing partner. Wojtkun said yesterday the sprawling property will be put into foreclosure by Sovereign Bank, which holds a $4.5 million mortgage. A Chapter 11 business reorganization filed recently in federal Bankruptcy Court in Boston by Wojtkun was dismissed last week, court records show. Golfers pay $5,000 per year for a membership. The season usually ends in November, so they’ve received about 90 percent of the value of their memberships, Wotjkun said. 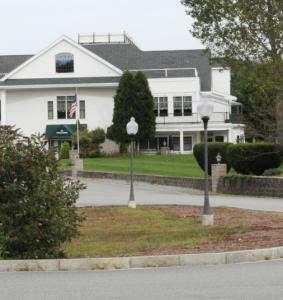 A spokeswoman for Sovereign yesterday confirmed the property, which includes an 18-hole championship golf course, clubhouse, pool, and banquet facilities, will hit the auction block. She added the bank is sorry for the brides, golfers, and employees impacted by the club’s money troubles. “We are sympathetic with those who are caught up in the difficulties,’’ Molle said. An auction date has not yet been set for the property. The property has $6.6 million in both first and second mortgages, according to the bankruptcy filing. Once the mortgages are covered, anything else can be paid out to creditors, including brides, Wotjkun said. Christina Doherty, who was due to have her reception at the club on Oct. 3, said she’ll worry about her deposit later. For now, she’s trying to decide if she should move her wedding to DiBurros’ in Haverhill or the Bradford Country Club. “We don’t have the luxury of three or four months to figure this out,’’ said Doherty, 26. The club had almost 100 employees, all of whom were to be cut their last paychecks yesterday, Wotjkun said. The money was paid from an account freed up after the bankruptcy filing was dismissed, he said. Wotjkun said he moved quickly to assist with cancelled functions. Last Friday, just after 4 p.m., after learning the refinancing plan had fallen apart, he spent $14,400 of his own money to buy food for four weddings held at the club last weekend, he said. “I personally put up the money so those brides would not be shut out at the 11th hour,’’ he said. He added employees contacted brides whose weddings were scheduled for this weekend, to help them find new venues, such as DiBurro’s, and Ipswich Country Club, he said. Leavitt’s daughter has moved her Saturday wedding to Lenzi’s Millhouse in Dracut, where they will have to set up a tent for an outside wedding. To make room for a dance floor, there can be no head table. “This is not the wedding she had planned,’’ Leavitt said.